Directions: From the southern entrance to the Baxter State Park, drive 15 miles towards the Roaring Brook Campground day use parking. From the parking lot, walk 0.3 miles to the Sandy Stream Pond wildlife viewing area. 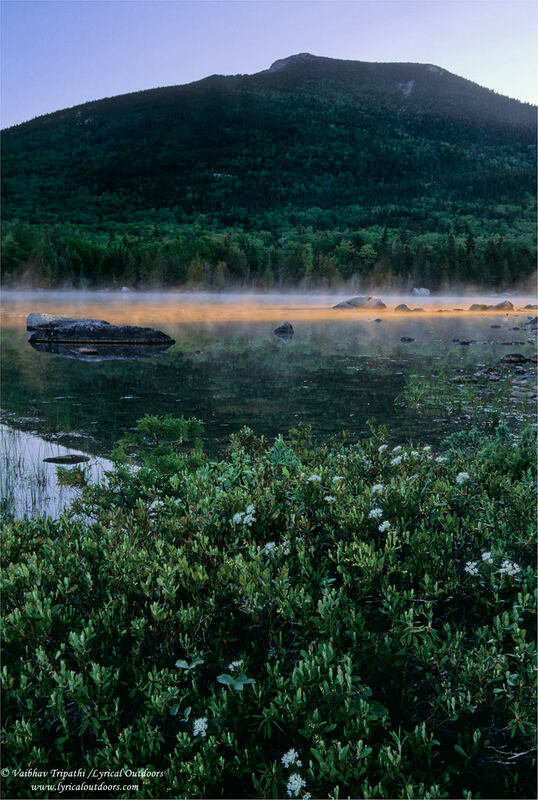 Baxter State Park is about 300 miles north of Boston and reached via I-95, ME-157 and Baxter State Park Road (5-6 hours of driving time). 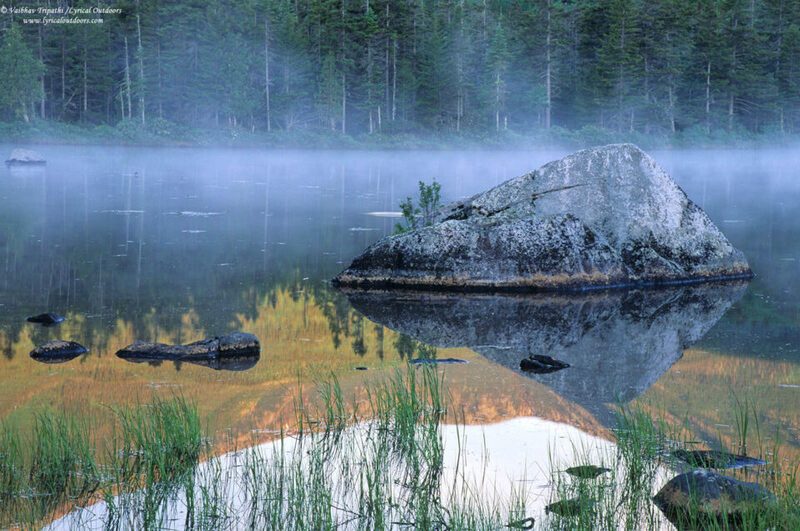 Sandy Stream Pond is a prime area to watch and photograph Moose and landscapes. I recently had an opportunity to spend 3 days in Baxter State Park and during that time, I spend one evening and the next morning photographing around Sandy Stream Pond. In the evening, scattered backlit clouds added some color in the sky. We also saw a cow Moose with two calves but the light was already too low to make any good photographs. The next morning, however was amazing. First, I photographed the lit peaks and reflections at sunrise. 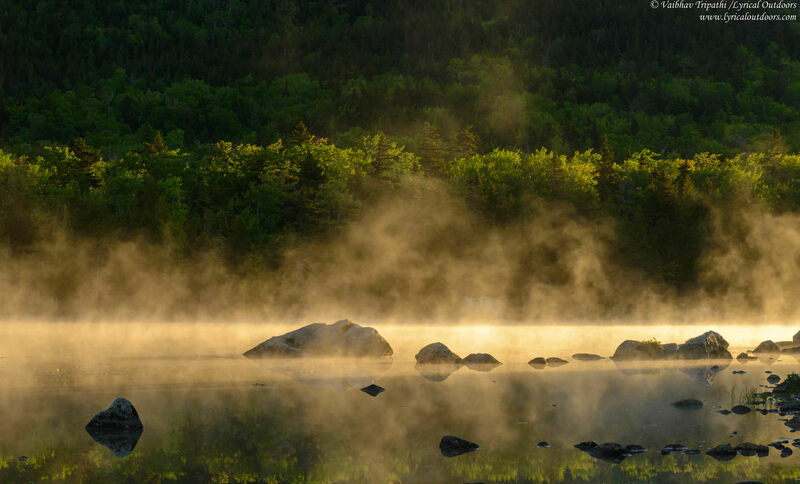 There was low lying mist over the pond, which got beautiful back light when the sun peaked over the horizon. It was a light show, I will remember for quite some time. 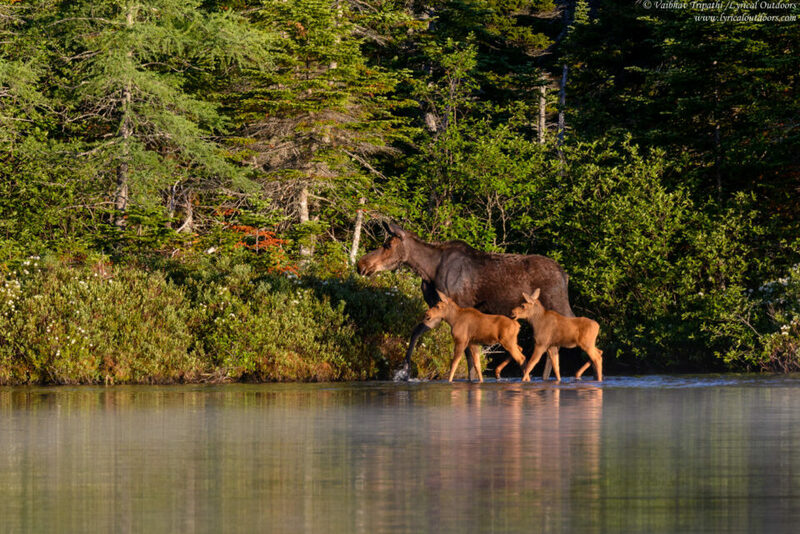 Then the cow Moose came out of the woods with her two calves. I was busy observing and photographing them when another cow Moose appeared and there was a little standoff and some action; which made for some interesting wildlife shots. 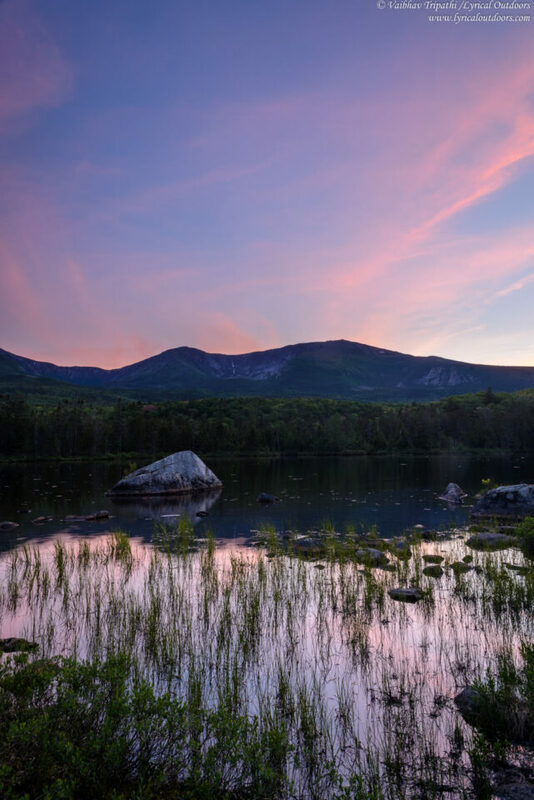 It is important to point that we camped at the Roaring Brook campground, which in my opinion is the only easy way to access the pond at dawn during the summer months. This is because the park entrance opens at 6 am and by the time you reach the pond, it is already past 7 in the morning (2 hours after sunrise) making the light flat for landscapes (Moose may still photograph well, though the activity may be low). However in fall, it might be possible to get to the pond just after sunrise even if you are not staying within the park. 1. Best light is usually at early morning and late evening. Since the pond is surrounded by mountains towards the west, it is in shade well before sunset. In contrast, the sun is behind you in the morning and paints the peaks with warm light at dawn. 2. Best season: Summer and Fall. 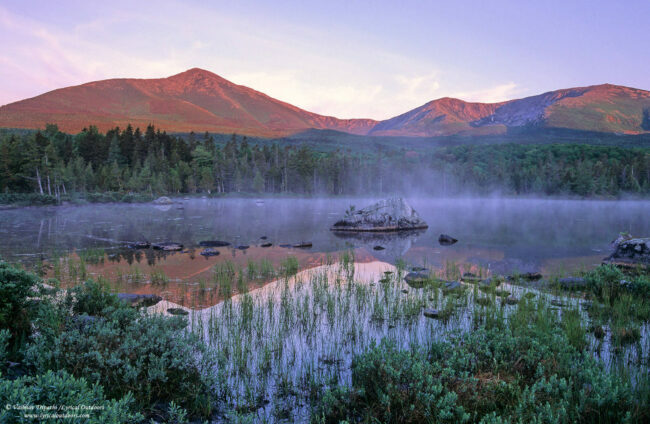 Baxter State Park is famed for its fall foliage and I intend to make a visit in fall. An overcast day should also work very well in the Fall season. 3. Lens recommendations: I carried a 18-35 mm, 24-120 f/4 VR and a 80-400mm lens along with TC 1.4x. I also had a 24 mm, 50mm 85 mm primes. A longer lens e.g. 500/600mm f/4 will let give you more reach more shooting wildlife. 4. Polarizer and a sturdy tripod are essential. This is a place for long lenses as there is a well made wildlife viewing platform. 5. Baxter State Park has plenty more to offer for nature, landscape and wildlife photographers. 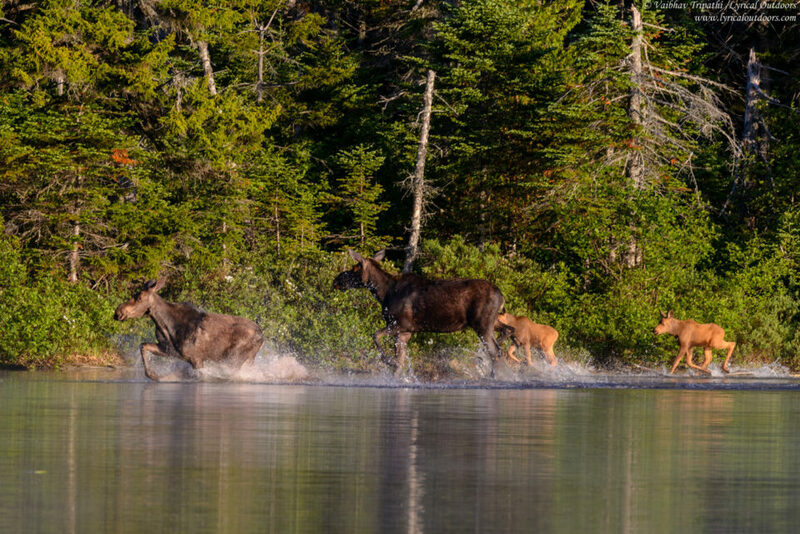 Check with the rangers for other Moose viewing areas, scenic hikes etc. For avid hikers, climbing Mt. Kathadin is an opportunity not to be missed.